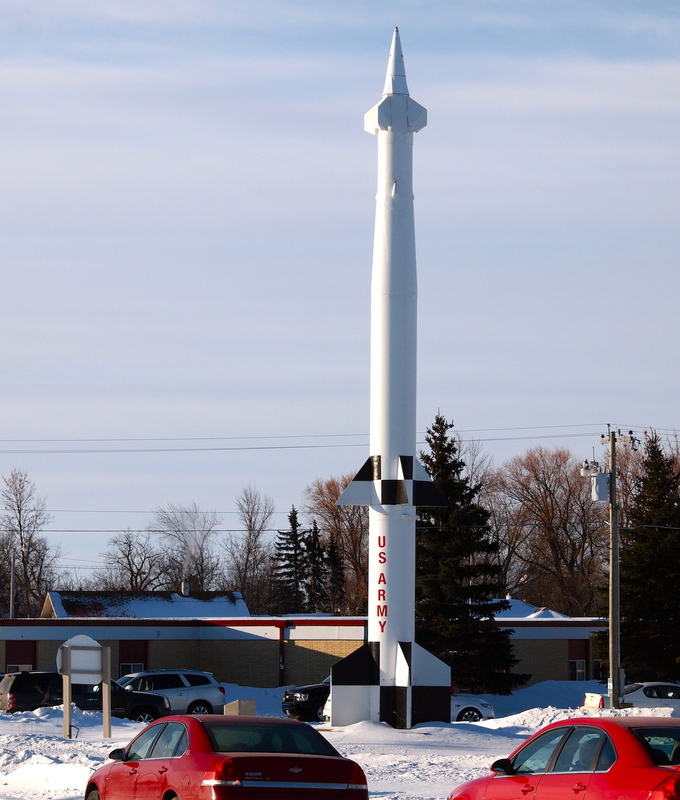 Some of the 20th century Cold War missile public art in Langdon, North Dakota. The Langdon Elementary School is immediately behind this missile. Molly and I are now back in Fargo, having returned from a couple days in Langdon, northeastern North Dakota. To my right is a small pincer sized Cypriot coffee (I trucked back a couple bags of the stuff upon finishing my eastern Mediterranean archaeological trench supervisory work in June 2012, some details of that here and here and here), and on the stove is a long link of smoked garlic Langdon Locker sausage (sides include grated horseradish, stone ground mustard, ketchup). Oranges are also going to make an appearance for breakfast. While in Langdon, though, Molly was on a special assignment with the Langdon public school system and the Northern Lights Arts Council. Her colleague and friend, Mindi Paulson, had an idea a couple months ago to co-lead an art project that would produce a mural for the entrance of the Langdon Elementary School. They decided to reflect the built landscape, or the wind turbine field immediately southeast of Langdon. The interesting thing about this 21st century wind turbine field is that it surrounds abandoned 20th century Cold War ICBM architecture, namely the Stanley R. Mickelson Safeguard Complex. In running errands here and there while in Langdon, and in viewing 20th century missile architecture in Langdon, I got to thinking about the perceptual shift in the Langdon landscape. 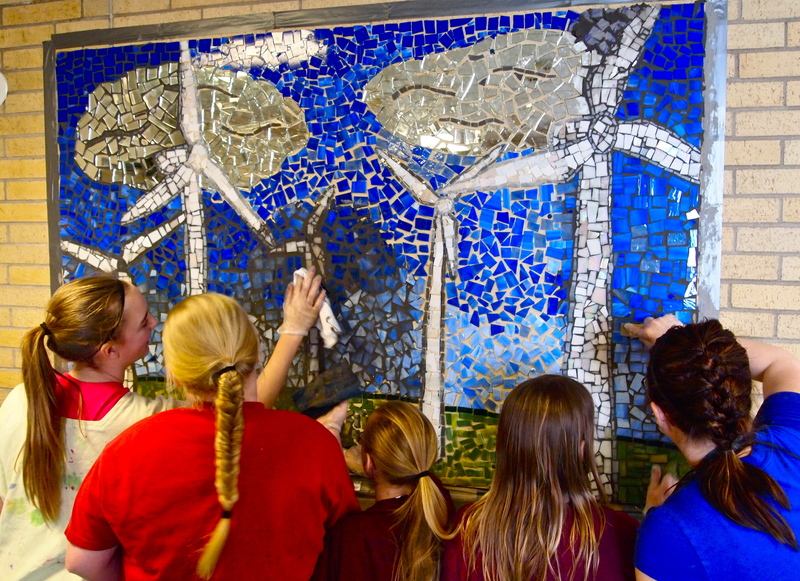 Teacher Mindi Paulson (far right) leads students in grouting the public wind turbine mosaic at the Langdon Elementary School. Last century, at least up until the fall of the Berlin Wall and the dissolution of the USSR, the public art projects in Langdon understandably amounted to potential nuclear holocaust, a byproduct of many things: competing D.C. and Moscow ideologies, Eisenhower’s military industrial complex, Cold War anxiety, eventual acceptance, and so on. David Mills has a lengthy monograph on this subject. And this century, instead of massive Federal military infrastructure projects that reflect potential nuclear Armageddon, we get architecture that reflects and generates green, renewable energy. And you can see how it bears on the public art projects. So today students learn about wind turbines and the hands-on of making wind turbine murals. Last century the public art was a different story. In the discipline of history, we call that a perceptual shift or an intellectual turn. Or something like that. Teacher Mindi Paulson explains the process of grouting to the students as Molly McLain grouts. This entry was posted on Saturday, March 1st, 2014 at 9:44 am	and tagged with Art, Langdon, Mindi Paulson, Molly McLain, North Dakota, Northern Lights Arts Council, Wind Turbine and posted in Uncategorized. You can follow any responses to this entry through the RSS 2.0 feed. Lori, please, by all means. Thank you!